all shapes and sizes, the budget 2 person camper like the innovativespaceship to a full familyluxury camper or mobile home. You also have another choice of camper rentals in Australia and that is the outback, off-road, 4WD, camper rental in Australiathese camper vans oz are a great way to explore the counrty. There areplenty of choices with the four wheel drive camper vans oz and we havereviewed several models to make your selection a little easier. Campervan rental Australia normally come fully fittedout with all the camping equipment you will need, many of thecompanies can even provide your first weeks shopping for when youarrive. That leaves you up the the best part of campervan hire Australia to driveoff on your adventure on Australia's vast network of road systems thatwill take you to any place you desire. Once you leave the populatedareas surrounding our cities like Melbourne, Sydney or Perth there arethousands of free camping groundsavailable. Most small town have several camping areas suitable forovernight campers. You need to ask what camping equipment, cooking gear, fishing tackleand any other equipmentis may be included in the hire and whatisn't. This can make a bigdifference to the amount of money you will require to spend onequipment, given that you may not what to take some of that equipmenthome. Another consideration iswhether you will be doing serious four wheel driving, not all campersare suitable. The ones that are generally not fitted with recoveryequipment, this is often an added extra and worth every cent when yourbogged. Read our recovery section for some Tip's on what to take. One of the best vehicles for serious offroad adventures will be the Land CruiserCamper, even as stock standard they will go most places easily. Notall campers rentals Australia or motorhome rentals Australia are suitable or even allowed offthe sealed roads, ensure the campervan you hire for outback Australiais capable of doing the trip you want. This applies to trips into theAustralian Outback on secondary or gravel roads. Imagine you get heavy rains and the roads flooded, you will need a 4wdcamper to ford deep rivers or you will just need to setup camp and waitfor thewater to lower in a couple of days. 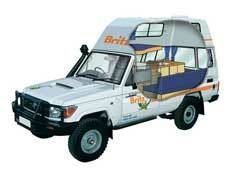 Ensure your camper such as a VW camper hire Australia is a diesel and also a new model with below averagekilometers. You need to ensure you are driving areliable camper. Don't hire an older cheaper van unless you know whatyour doing and they have great support. Pay the extra for anewer model or visit our links and get a cheap deal on a new model.It's money well spent. You don't want mechanical problems on yourholiday. Consider booking your Australian Campervan or Four Wheel Drive Camperearly and locking in a cheap price if you require a campervan duringthe busytourist season. Thats easy to work out, just look at the prices. How to choose the correct campervan or 4WD camper in Australia justtakes some planning. First define your holiday, then visit our mapspageand get google direction for the entire trip, this will detail theroads you'll travel on. A good plan provides you with the knowledge torelax and enjoy your holiday because you have made the correct choiceand now have the freedom to explore the Australian Outback. Witha four wheel drive campervan you can go anywhere, you will be able stayin some amazing places others cannot reach, and you can take advantageof the thousands of free camping grounds and never pay foraccommodation. There are many campervan and motorhome rental Australia hire companies, you can select asmaller local company or choose an international company such as Hertz,Avis, Brit z, Apollo, Maui and KEA. Most people choose the largercompanies, however many of the smaller local companies such as spaceshipscan provide afar better afforable service and an innovative vehicle suited to yourneeds. 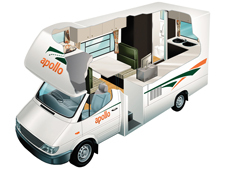 Some companies specialise in motorhomes (large Campers), andthere are companies that just provide campers in Australian states orregions, such asthe East Coast of Australia. I did mention $1.00 a day camper vanhire, yes it is possible. Many people only want to travel oneway in a camper, if you can find a camper such as the spaceshipsthat needs to be returned toit's home port and your going that way great. Normally thesedeals are tight on time, however you can normally extend for a day ortwo at preferred rates. It's worth considering.